Of all the assemblies and parts on a typical two-stroke snowmobile, reed valves might be one of the most neglected. All too often, snowmobiling enthusiasts compromise on performance or deal with an engine that's difficult to start because of worn reed petals. Laziness isn't a good excuse for letting worn reed petals ruin a fun-filled snowmobiling season. By reading this guide, you will learn how to replace reed cages and receive helpful maintenance tips along the way. With the proper tools and a push in the right direction, you can keep your sled ready for the snowy trails ahead. In any pre-season snowmobile maintenance schedule, the reed valve system should be at the top of the list. A snowmobile's reed valve system is responsible for preparing and feeding the air and fuel required for combustion into the sled's cylinder heads. When an engine is hard to start or you are experiencing a horsepower loss, you can generally assume that the engine reeds are improperly set up or the reed valve system requires your immediate attention. There are many reasons why reed petals wear out, but it is usually caused by constant flexing, and the passing of fuel causes chips, cracks, or curled edges as the solidified resin used to manufacture the petal softens. Hard starting is a symptom of low compression, which may require a few extra pulls on the recoil handle to get the engine going. Poor throttle response is usually a sign that the reed petals may be worn and need to be replaced. Though you can baby the throttle and keep our engine speeds low, there isn't much you can do to prolong the life of your reed petals. We recommend pulling out the reed cages and examining the petals every 2,000 miles, depending on how often you ride. 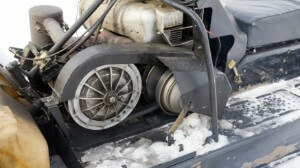 Replacing the petals in your sled's two-stroke, reed-inducted engine may seem daunting, but it's actually pretty easy! Remove the sled's side panels, set them aside, and remove the two screws that fasten the hood to your chassis. Stand on the right side of the snowmobile and slide the hood forward about one inch to disengage the tabs from the console. Lift the hood up, so you can unplug the wire harness from the gauge. Remove the hood and pry up the plastic rivet that attaches the left side of the console to the fuel tank in order to gain access to the fuel pump. Grab your tool kit. Use the L-shaped belt removal tool to remove the snowmobile's belt. Squeeze the brake lever and use your wrench or a socket to remove the bolt that secures the secondary clutch to the jackshaft. Remove the secondary clutch and set it aside, being careful not to lose any alignment shims in the process. Remove the clutch guard and oil tank to gain access to the engine's intake. Start by removing the fabric wrap that encases the connectors and wires near the front of the oil tank. Follow the wire that leads from the oil level sensor to the male/female connector. Disconnect the oil level sensor. Unhook the two rubber straps that secure the oil tank to the clutch guard and remove the two bolts that attach the oil tank to the engine control unit. Reposition the oil tank so that it's out of the way and secure it with a zip tie. Unplug the wire harness from the engine control unit and the voltage regulator but be sure to leave the engine control unit and the regulator bolted to the clutch guard. Twist off the four nuts that secure the clutch guard to the chassis. Remove the clutch guard and set it aside. Remove the bolt that secures the fuel filter bracket to the airbox, unhooking the two fuel lines from the fuel pump and unplugging the wire connection from the pump. Note each fuel line's attachment point before you disconnect. Tip the intake tube out of the airbox and carefully disconnect the wires from the air pressure sensor that is attached to the intake tube. Remove the tube and set it aside. Unhook the four retainer clips that secure the upper airbox to the main air silencer and remove the upper box from the chassis. Use a 12-inch No. 2 Phillips screwdriver to loosen the clamps that secure the intake silencer to the throttle bodies. Remove the air silencer to expose the throttle bodies. Use your screwdriver to loosen the hose clamps that secure the throttle bodies to the intake boots on the crankcase. Once the clamps are loose, carefully pull the throttle body assembly a short distance away from the engine and locate the oil pump arm, that is connected to the assembly between the magneto and PTO throttle body. Carefully push the arm off of the assembly, tip the assembly up and out of the way, hanging it with a zip tie to gain full access to the reed cage assembly. Remove the fuel rail located directly above the throttle body from its mount on the engine. Use an 8mm socket on a 0.25-inch drive ratchet to loosen the six bolts that secure the reed cage assembly to the crankcase. Remove the intake boot assembly to access the reed cages. Inspect the petals for chips, cracks, or curled edges. Install your replacement reed petals and confirm correct orientation on the crankcase based on the notes you took in Step 6. A shot of carburetor cleaning solution may help the throttle bodies slide back into the crankcase intake boots and tighten the reed cage mount bolts in a crisscross pattern. Now that you know how to replace reed cages, you can take every step necessary to keep your snowmobile's reed valve system in tip-top shape. At Polaris Parts Nation, we proudly offer an assortment of reed valve replacements and complete reed cage assemblies for Polaris liquid-cooled engines. If you have any questions about this guide or would like to learn more about the available parts in our inventory, please contact us today for additional information.